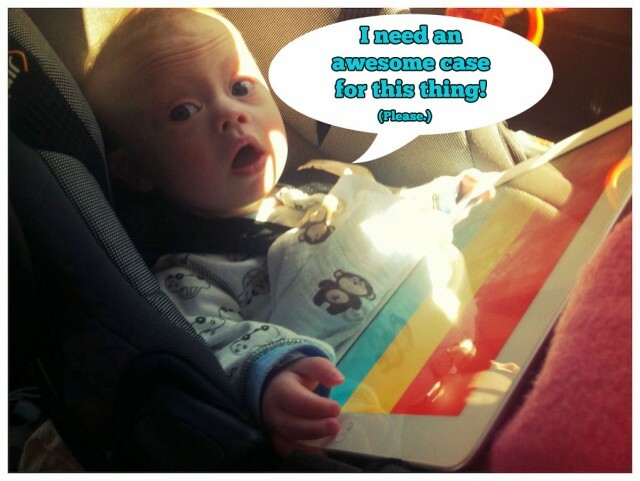 Our Hunt For The Best iPad Case For Our Kid! Noah’s only 20 months old, but he’s been a fan of the iPad ever since his tiny fingers first touched that glorious glass screen. He enjoys the interactive books, playing fun games, watching movies, and checking out his Baby Signing Times videos on it! The problem with the Smart Case (and most other iPad cases)…. After doing a little research on the best iPad cases for a young child, these 8 iPad cases really rose to the top. I thought I’d put a list together to save you the trouble of having to do the research on your own. By the way, all of these cases are available on Amazon, which means they can be shipped! So feel free to forward this post to any grandparents who may be looking to buy an iPad case as a gift for their little grandson / granddaughter!. Oh, and if you are thinking of buying your child an iPad, make sure they have these 6 other gifts that are way cheaper first. 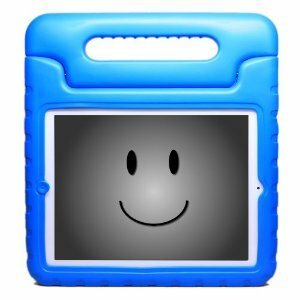 I hope you find this list helpful in your search for the top kid’s iPad cases. 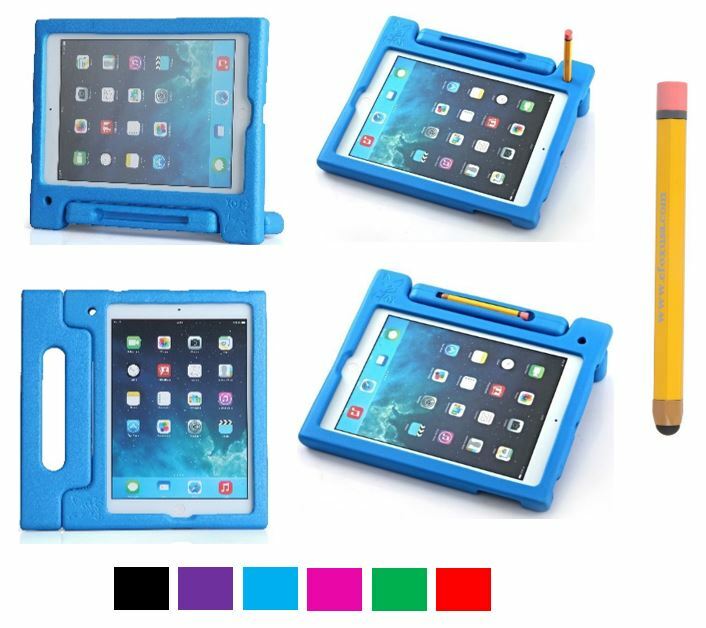 Do you know of an iPad case that is awesome but didn’t make the list? If so be sure to leave a comment at the end of this post and let me know. And if it is indeed awesome, I’ll be sure to add it to this list! 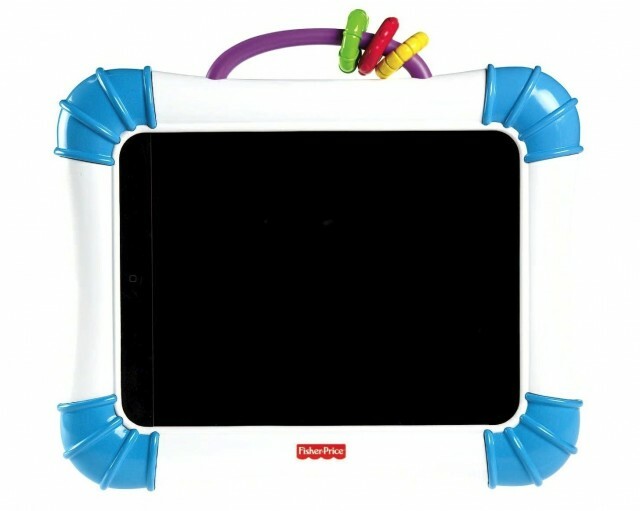 There are a few things I really like about the Fisher Price Apptivity iPad case . 1. Our son already own (and we really like) the Fisher Price Apptivity iPhone case. 2. I really like how this case covers the iPad’s home button. One of the things I dislike about the iPad is the fact that you can’t disable the home button. (Although a fix for this is coming in iOS 6!) Ever time I try to let Noah use the iPad on his own, his curious little hands head straight to that home button, which of course closes the app. However, this case is big. Like really, really big. Like clunky big. You get what am saying? 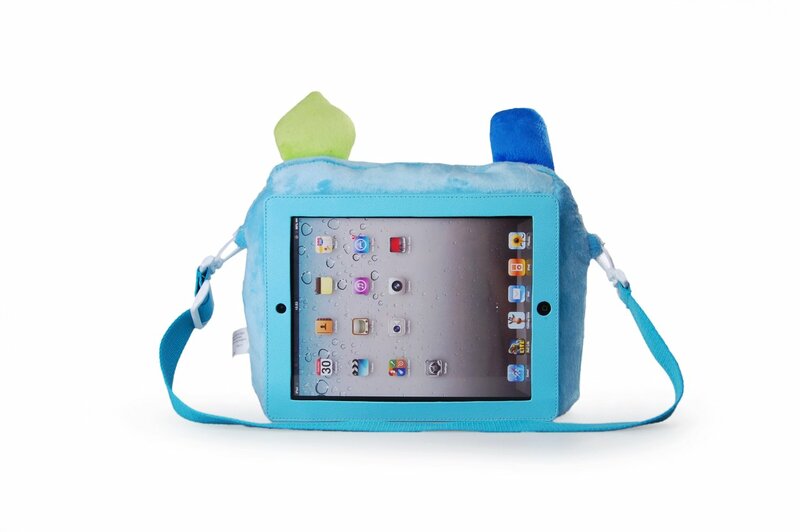 It’s still a nice case, that will almost certainly baby-proof your iPad, but we passed on it just because of its size. 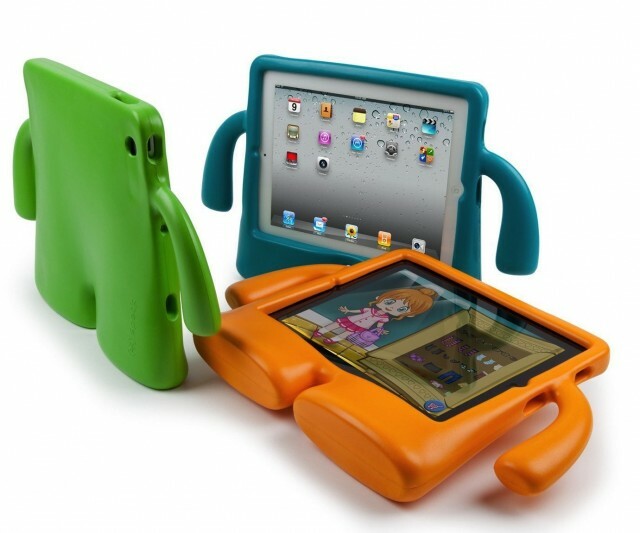 This Speck iGuy iPad Case is a popular ipad case for kids, toddlers, and babies because the rubber arms can help your child hold on to the iPad while they are using it. I also like how the rubber feet allow the iPad to stand up on a counter, table, which allows your child to watch a movie / or video on the iPad without holding it. Check out the Big Grips Frame for iPad case. 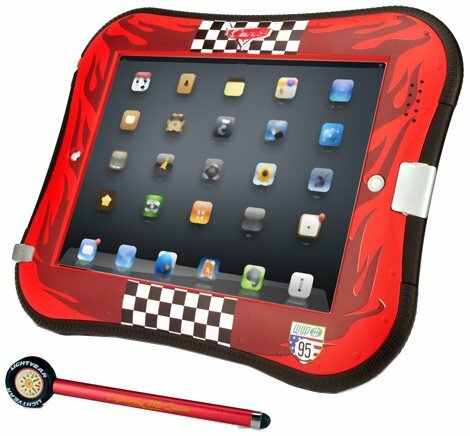 Check out the Disney Cars iPad Case . 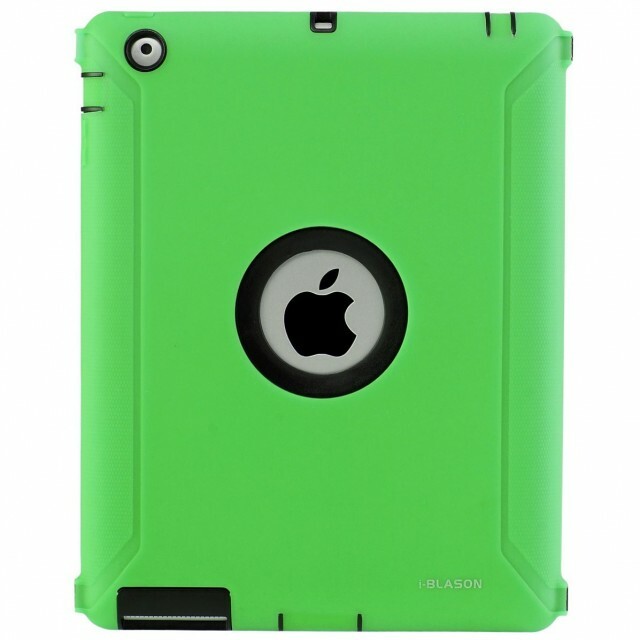 Check out the KaysCase KidBox Cover Case for Apple iPad 2, iPad 3. 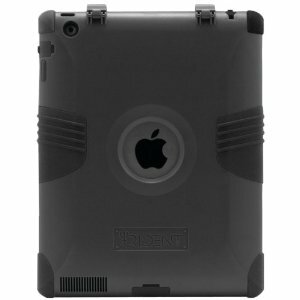 Check out the Trident Kraken II Hybrid Case for iPad . Check out the OtterBox iPad Defender Case . Do you have any of these cases? Was there a case we missed? I want to think our friends on Twitter who gave us their iPad case suggestions, as well. This list is a GREAT help! But I was wondering if any of these cases had a protective cover to cover the screen to protect it from spills etc.? Thanks for the comment, the fisher price case I linked to does have a screen protector, it’s worth checking out for sure. I ‘m from the Netherlands and searching for such cases for a long time now. Do you know any brands that sell these for Samsung tabs? Griffin Survivor – nice protection! Hey, great article. I was wondering if you might get this company to let you review their case? We have an Otter. Its undestructable, but its hard to access the volume button and also the rubber part broke. My favorite is a good leather one with a cover that closes like a book. Those regular iPad cases are awful! I once let mine fall on the floor because of that cover. I have a big grips on my daughter Shay’s (she has CP, seizures disorder and is a wicked thrower) and an armour box/gorilla type case on the ones my boys use. We have tried a leather case that worked pretty well for our generation 1, it did break one day when my daughter threw it (the iPad not the cover). When that happened we bought the Speck1Guy iPad case and my daughters could easily take their iPads out of the case and for some reason always did. We just got gen 2 iPads and bought the Otterbox Defender and Otterbox Reflex (we wanted one pink and one purple and neither one had both colors). I like the reflex case much better. It’s is a much softer case. As far as protection goes, we just got them so not sure, they haven’t been thrown yet. I’m afraid that if the defender case is thrown and hits someone it might hurt quite a bit. Let’s hope that doesn’t happen. We started with an OtterBox, but it didn’t take long to stretch out and our daughter could take it off easily. We switched to the Gumdrop and it’s been at least 6 months with no signs of stretching. Our iPad is very well protected by the Gumdrop, even though it’s been dropped a lot (ok, thrown down some too!) and the protective screen cover has saved us from many spills and messes. I’m very happy with the Gumdrop! Great article!!! I find my answer from this article!!! I’ve got an 11-year-old daughter with DS. We’re using the Belkin Survivor like a few other commenters above, and it’s been great. Having a built-in screen protector is excellent for keeping licks and juice splashes out of the iPad! Nice post. I was checking constantly this blog and I’m impressed! Extremely helpful information particularly the ultimate part 🙂 I deal with such info a lot. I was seeking this particular information for a very lengthy time. Thanks and good luck. PadPouch is pretty ugly case. Thanks for sharing. I just bought a new case with two handles for my 3yr and 2yrs boys they love it. http://www.kidsafecase.com. New product but i am relaxed when they drop it. 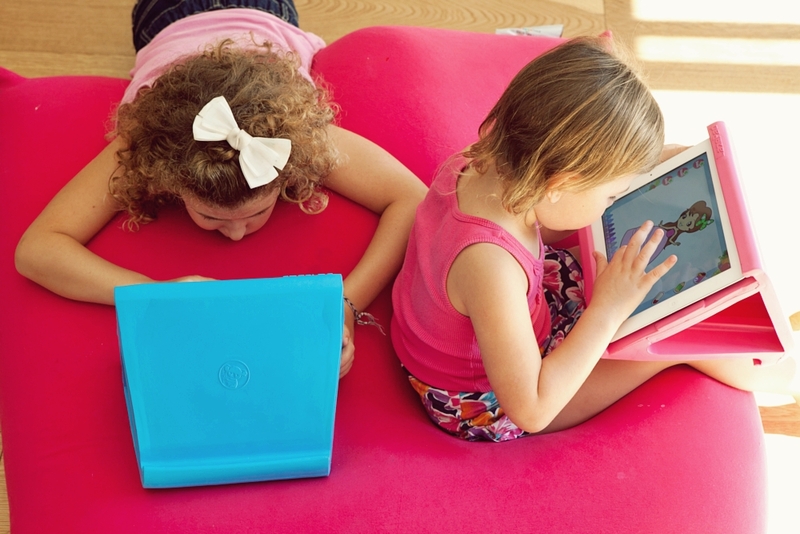 Lazepad is the world’s first holder and pillow combination made for children and adults. We’ve had a Clumsy Case, going on 2 years now, which offers foamy protection. Highly recommended! We offer lots of different products on our website which part of the proceeds help to fund down syndrome research and promote awareness. Our product is design to kids and toddlers, this is a truly unique product. Hope it will fit your list. 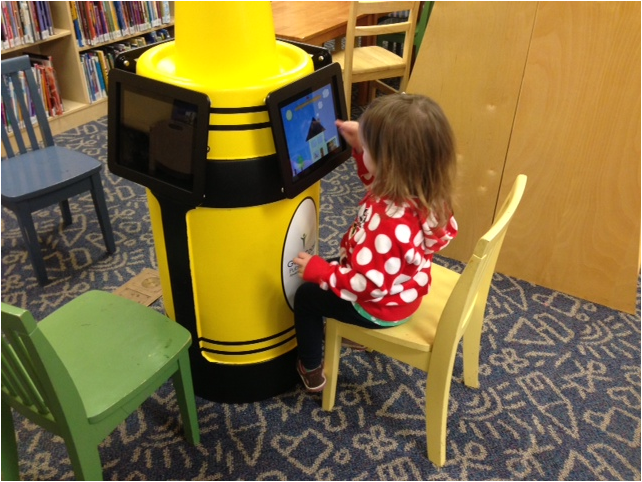 We found this cool kiosk and cases for iPads at our library too !!! We have three kids and all have gotten ipad 2’s by their first birthday, and a mini by their second. We have been using the Griffin Technology: Survivor Military-Duty iPad cases. I literally fimd iPads on the floors in the kitchen, etc, everyday, many times a day. I have herniated discs (no excuse for prior the medical conditions, but…) and I have always just gotten my foot beneaththe ipads and just flung them from room to room, so etimes across the house into their play room. The oldest case has had a few broken plastic pieces inside, but the oldest iPad to this day is absolutely pristine. The kids take them outside and literally drop and toss them to the concrete at all angles. They also have some desire to stand on their iPads, both sides. By the way, they all have protective films on them, which I believe is part of the trick from a split or cracked screen. Have confidence inthe Griffin Survivor lineup. And don’t bother spending $60-89 in big box stores. Buy through Amazon with free shipping starting at around $25. Great article.Shenzhen Hucos Technology Co., Ltd. Located in SEG Plaza of Shenzhen Futian District, the factory located in Pingdi town of Shenzhen Longgang District; the factory was founded since 2003 with 8,000 square metres for plant area, there two main department plastic&metal and leather Devision which professionally engage in design development and manufacture for various plastic, electronic accessories, metal molds, leather case，wallet & bags, the main product such as metal & die pressed casting parts for mobile shell, LED lamp metal part, various metal parts related electric appliance, and leather protective case for various intelligent portable device such as Smartphone and Tablet, wallet & bags, etc. The factory has a group of experienced design and project development management of the team, implement the project responsibility system, provide customers with the most excellent OEM/ODM service. The factory with favorable incentive system attracts numerous industry elite to join, and Jointly develop a good working environment and build a competitive business platform, at the same time obtained a large number of customers with high satisfaction. The factory have a complete quality guarantee system and a corporate social responsibility system, and implement ISO 9001:2008 standards strictly. With all our products living up to the international standards, the factories have passed several tests conducted by our clients directly or by third-party audit institutions. The company strictly implement management philosophy as “management Institutionalized, Simplification, Hommization, Rationalization ”, and focus on “speed, quality, cost” . “Customer Oriented, reputation first; Mutual benefit and reciprocity, Excellency Pursuing” is our service objective. Hucos is willing to work with all partners from domestic and abroad, working together to create brilliant career. I know the post is older so I bet you know but…. Guided access is the BEST feature of the iPads now. Locks the app, volume bad you can disable buttons. Life saver! I know this post is older now but we’ve had some great feedback from parents about our iPad stand, the iBeani (www.ibeani.co.uk). 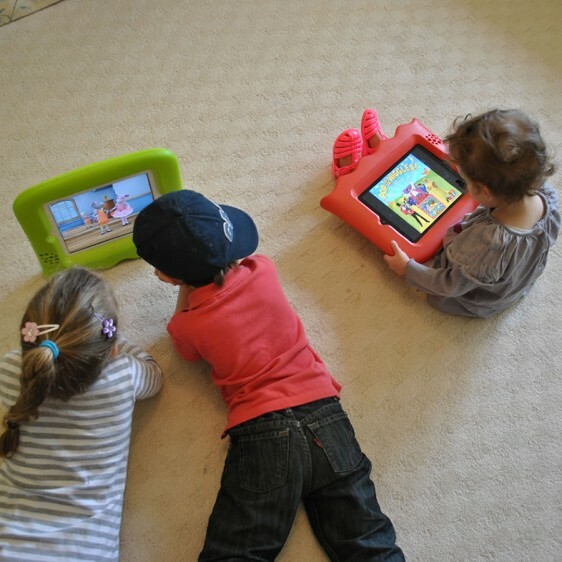 It gives kids a great stable surface to use the iPad on, reducing the risk of breakage. It also reduces muscle strain & fatigue, reducing the chance of injury – no more sore arms!